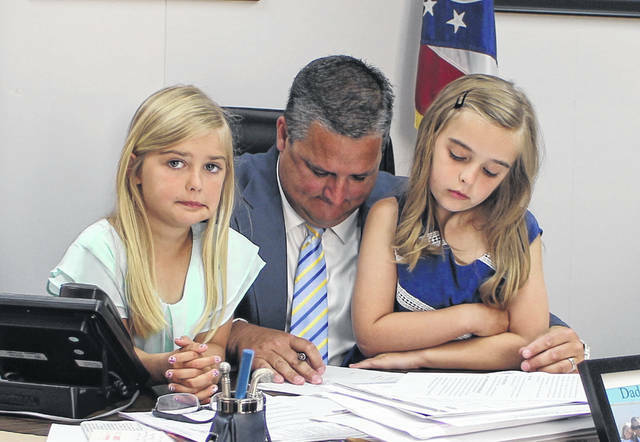 Shane Wilkin, center, attends his last meeting as a Highland County commissioner on Wednesday with his daughters, Parker, left, and Piper, right. Shane Wilkin, left, is administered the oath of office in Columbus Wednesday by Judge Kevin Greer as Wilkin’s wife, Kristy, holds the Bible and their daughters, Parker and Piper, look on. Emotions ran high Wednesday as Highland County Commissioner Shane Wilkin tendered his resignation from the commission after 10 years on the job. 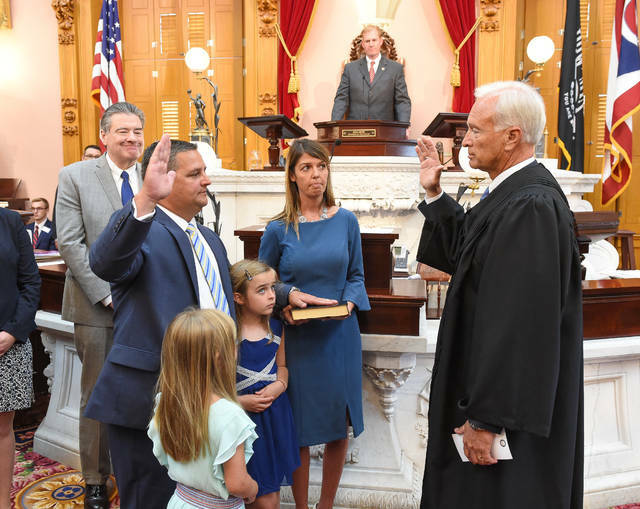 Later Wednesday, Wilkin was sworn in as state representative from the 91st Ohio House District by Highland County Juvenile and Probate Judge Kevin Greer in a ceremony at the statehouse in Columbus. County Auditor Bill Fawley and Commissioner Terry Britton said Greer offered complimentary remarks about Wilkin before administering the oath, and Wilkin followed by thanking his family and others. Fawley and Britton said Wilkin’s name appeared on the voting board immediately after he was sworn in. Wilkin began casting votes on various bills immediately upon taking office. Wilkin was seated in the legislature after winning the May GOP primary against Clinton County businesswoman Beth Ellis. House GOP leaders decided to immediately seat the winner of the primary because the seat was vacant due to the resignation of House Speaker Cliff Rosenberger after the FBI opened an investigation. In November, Wilkin will face Democrat Justin Grimes and independent candidate Todd May, both of Clinton County, for the full two-year term beginning in January. At the Wednesday morning commissioner’s meeting, Wilkin, with daughters Piper and Parker by his side, handed in his resignation to fellow commissioners Jeff Duncan and Terry Britton with tears in his eyes. Highland County Auditor Bill Fawley, who has shared a close relationship with Wilkin over the years, said that early on in Wilkin’s campaign for the 91st House District, he told Wilkin that no matter the outcome, Highland County would have a good commissioner or a good state representative. Duncan moved to accept Wilkin’s resignation and wished him well in Columbus. Britton thanked Wilkin for mentoring him when he was new to the commissioners office, and said he looks forward to seeing what Wilkin does in Columbus. Wilkin thanked local media for covering the commissioners office fairly and holding the board accountable, and said Highland County is left in good hands with Duncan and Britton. Wilkin said Fawley “has been great helping to keep us out of trouble” at the auditor’s office, and that while budget cuts during the recession proved particularly challenging, teamwork between department heads got the county through times of economic stress. Wilkin lauded commission Clerk Nicole Oberrecht for her part in securing economic development projects, adding that he wished she could work for him in Columbus. Wilkin thanked the citizens of Highland County for allowing him to serve as commissioner, and said he looks forward to continue representing the county, albeit in a different capacity. “I am only a phone call away,” he said. The commissioners approved Wilkin’s resignation on Wednesday, along with routine financial resolutions.